Photographer, Mike Worthy, captured this picture of the sun at total eclipse showing the sun’s corona, the atmosphere of the sun. See NASA’s website: https://eclipse2017.nasa.gov/sun. The photo was taken August 21, 2017 at Marshall County, Kentucky. Thank you, Mike! An eclipse of the sun is a rare event. A total eclipse passed across the entire United States on August 21, 2017, the first such occurrence in nearly 100 years. Rita and I travelled to Marshall County, Kentucky to meet beekeeping friends, Shirley Murphy and Mike Worthy along the path of the moon’s totally shadowing the earth. The trip was worthwhile. 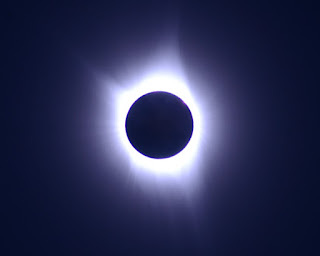 The experience of observing a total eclipse is significantly different from witnessing the same event a short distance away in the much wider area of partial eclipse. The 70-mile-wide area of total coverage of the moon’s shadow affords researchers and photographers an opportunity to observe the sun’s structure in rare detail. It also provides a rare and awe-inspiring spectacle of nature for anyone in place. 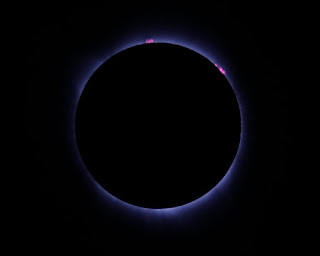 Mike Worthy, an accomplished photographer and amateur astronomer, photographed the eclipse. Here is Mike’s photo of the sun at total eclipse, showing solar prominences, red streams of hot gasses looping hundreds of thousands of miles out into the sun’s outer atmosphere. See NASA’s website for a description of solar prominences: https://www.nasa.gov/content/goddard/what-is-a-solar-prominence. As the moon crossed in front of the sun, the sky slowly darkened. Within a few minutes of total eclipse the air cooled and colors shifted. August lawns turned a brighter green; Mike’s white car turned silvery gray. When the moon finally covered the sun, the sky abruptly darkened. The only light showing was an orange glow in the horizons. Planets and mosquitoes appeared. Song birds called, and crickets chirped. Beekeepers questioned how honey bees would react to light conditions darkening to nighttime at mid-day. Alert beekeeper, Brent Ferguson, along with three others in his bee yard in central Arkansas in the area of partial eclipse, watched the bee hives for any change in the bees’ behavior. There was no observed change in behavior. Did the foraging bees change their navigation from solar guidance to ultraviolet, magnetic, or odors? Eclipses are rare; honey bees are resilient and capable of operating in rapidly changing conditions.